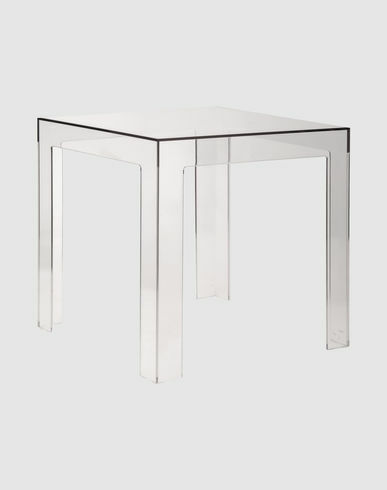 A small, completely transparent table of compact, perfect dimensions: 15.7 x 15.7 x 15.7 in (40 x 40 x 40 cm). Crystal-clear, colourful, elegant and trendy, it is practical, durable, secure and functional, all at the same time. Jolly is a versatile, elegant and playful side table now available in a new transparent or batch-dyed polycarbonate version, which is more shock-resistant and weatherproof. Paolo Rizzatto was born in Milan in 1941 and received a degree in architecture at Milan's Politecnico in 1965. Architect and designer, his design work has been particularly focused on interior lighting, and from 1969 to 1977 he worked for Arteluce. In 1978 he founded the company Luceplan, together with Riccardo Sarfatti. The lamps designed by Rizzatto stand out for their elegance and advanced technology. Many of his lamps were designed together with Alberto Meda. In 2000, he designed the Lord Jim armchair for Mortina.